We're joined in studio by prominent Boston transit advocate Rafael Mares, Vice President and Director of Healthy Communities and Environmental Justice for the Conservation Law Foundation. CLF has been instrumental in improving access and mobility for MBTA users, including holding the state to transit project commitments they've tried to wiggle out of. We discuss the current state of transit operations and investment, the Control Board and politics, the fate of long-awaited projects such the Green Line Extension, the Big Dig legacy, and much more. This episode was recorded on May 16 in the studios of WMBR 88.1 FM in Cambridge, engineered by Scott Mullen. Find Rafael Mares online at @RafaelMares2 or CLF. Like what you hear? Share it around, tell your friends and colleagues, and subscribe to the blog and podcast (on iTunes) to be notified of new posts and episodes. Support our work by becoming a member, making a donation or signing up to volunteer because we can't do this alone. Let us know what you think: connect with TransitMatters on Facebook or Twitter. Follow Jeremy Mendelson @Critical Transit, Josh Fairchild @hatchback31, Jarred Johnson @jarjoh, Marc Ebuña @DigitalSciGuy, Scott Mullen @mixmastermully or email us here. When Does "Operational Efficiency" Mean a Better MBTA? Recently, a certain lobbying group has been arguing that the MBTA shouldn't be judged by how many people use it to get around, but rather by how many dollars it costs to run a vehicle for an hour or a mile. This cost per mile argument follows on the heels of their recently debunked assertion the that T is overfunded as compared to other transit agencies when looking at cost per trip. Those cost per trip comparisons didn't really make sensebecause they tried to compare the T to transit systems which provide vastly different services, which require different levels of investment to serve different populations (i.e., some agencies run only local bus or rail service, while the T does all of those, plus regional commuter rail, express buses, ferries, etc.). Spring has sprung today for transit as NYC MTA CEO Thomas Prendergast announced a small donation of snow fighting equipment and the Governor announced a commitment of $30 billion over 15 years to drastically upgrade the MBTA's infrastructure and equipment. With strong support from the Green Line extension team, DOT Communications staff has done a total of 53 separate posts with Green Line Extension meeting, outreach, and construction information since the MassDOT blog debuted 50 months ago. More than one [post] per month on average and more than on any other single MassDOT/MBTA project. Each of those posts was accompanied with a Tweet and link on Twitter. Each such item is now also posted on our more recent MassDOT Facebook page, including two FB posts within the past week- one on the upcoming meeting and one displaying one of the Flickr construction photos. We have a Flickr set established to add future construction photos. All this in addition to the separate efforts on T social media. The biggest highlight is MassDOT's latest album on Flickr, which captures the construction and is a great visual progress update. MassDOT has been doing this for some time to show very occasional and infrequent updates on bridge construction for the Accelerated Bridge Program, but the MTA has been posting album after album of construction updates for even less time. MassDOT started in the summer 0f 2009 with 1,165 uploads while the MTA has uploaded over four times that in half the time, starting with its first post in March of 2011. Granted, the MTA has at least one dedicated photographer, but it has roughly the same number of ongoing capital projects and maintenance needs as MassDOT and the MBTA combined. Suffice it to say, MassDOT's planning site is well-organised, but much of the information is either hidden deep within many clicks or in lengthy PDF documents; the closest thing to a dashboard is the 'Projects' tab on the main MassDOT page. The MBTA's project page is slightly better, but is a simple table that doesn't give indication of scope or size of projects, instead listing project statuses. Deeper in, there isn't much consistency to project documentation, impact, or even format. Other agencies have varying levels of success with building project dashboards. The CTA has a presentable planning site that highlights major upcoming projects. BART's project site is incredibly accessible through its good design via simplicity. SFMTA's site is more text-heavy, but highlights major projects well, perhaps only by default because they have fewer but wider-scoped projects. Washington Metro also has a very text-heavy project page littered with links to PDFs, but many of these are studies and preliminary analysis for projects and are well-organised into major categories on a single page. WMATA even has a rider-oriented blog-style site called PlanItMetro for focused feedback and updated on various projects, similar to MassDOT's blog. The NYC MTA, which has far more ground to cover than most in gaining public trust, has the best capital projects board; the capital projects are organised by division, similar to the way our capital projects are presented, and outlined with a breakdown of estimated and actual cost and deadline with notes for any discrepancy. NYC's MTA arguably has bred a similar, if not deeper, strain of distrust as the MBTA and re-constituted MassDOT, which didn't exist until nearly four years ago. The MBTA/MassDOT need this kind of visibility and information accessibility. The T and MassDOT/former EOT have come a long way to show that they hold themselves accountable to its stakeholders outside of hour-long update meetings, regardless of whether the current people in leadership are responsible for the decades of actions that have bred the distrust in the agencies. A Flickr or Twitter feed or even Facebook page are more accessible than a physical meeting or even a PDF of the PowerPoint presentation from the meeting posted to the web. The Green Line Extension does have a Facebook page, but as of this writing is not linked from the main project site, which suffers the same disjointed branding, presentation, and deep linking of information as many of MassDOTs other project pages. This capital project is the most promising in being a consistently transparent project through regular photo updates, but this consistency needs to be pushed across all projects and start well before any shovels hit the ground. This will be hard for the much maligned and beleaguered agencies, but both Secretary Davey and MBTA GM Scott deeply know and daily act on how important transparency is to public accountability and trust. While they're just getting started turning things around, many others in their field are leapfrogging past them and we can learn from those advances going forward. In coordination with local and state officials, all MBTA services were shut down early morning two Fridays ago, to facilitate efforts in the manhunt for the remaining suspect responsible for Monday's Boston Marathon bombings. Jonathan Cruz of Dorchester was on his way to his apprenticeship at Youth Build Boston, a program that teaches young people construction skills. An acquaintance stopped him on his way to the JFK/UMass Red Line station, warning him service was cancelled, but Cruz kept going, hoping to get more information at the station. He arrived at the station at about 6:30 a.m. and found no signs about service [cancellation] and no employees, he said. His program has a very low tolerance for tardiness, and he was supposed to be in Roxbury by 7 a.m.
“I think they should have put signs up but the problem is, we have the Internet and we watch TV all the time, so they thought we would know,” he said. Xheni Kurdari walked up the stairs at the JFK/UMass station and tried to open the station’s doors. No luck. She could not make the short commute to her job at State Street Bank and Trust Company in Quincy. Kurdari said she went to bed early the previous night and did not hear the news of the police chase and shoot-out with the bombing suspects. She heard some sirens in the morning, but did not think much of them. 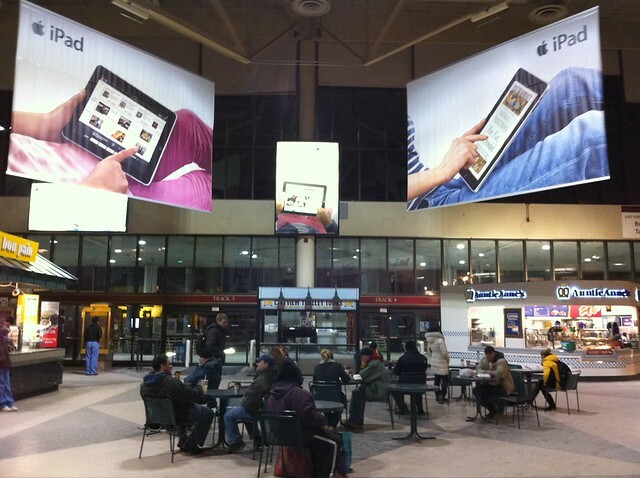 Digital notifications are still one of the least effectively advertised customer information features in stations that can prove useful outside of it. I'm still surprised daily the number of passengers I encounter who don't realise that they can sign up for text-based 'T-Alerts' to their phones via SMS that don't require a smartphone. Even fewer people realise they can go to sites like NextBus.com for realtime bus arrival times and HowsTheT.com for realtime train arrival times from their PCs before they ever leave from home or work. Of course, the MBTA website continues to be an indispensable resource, granted you can and know how to get there. Reaching out through the press in papers, television, and radio, can help circumvent the digital divide that still very much exists, even in Boston. 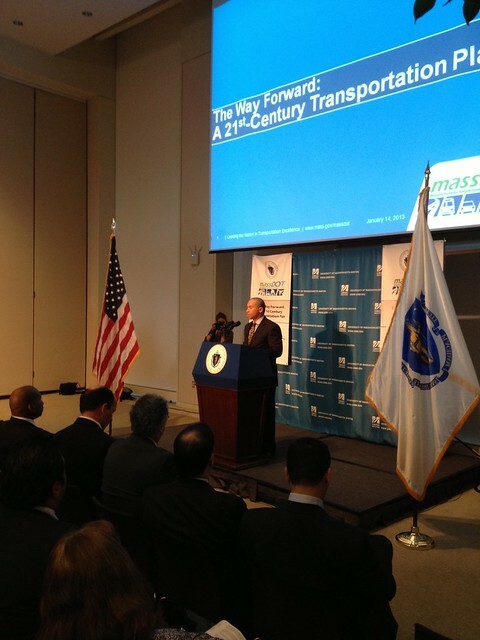 Has MassDOT Reached the End of the Road for Internal Reform? Two Fridays ago, Governor Deval Patrick stated that he would unveil a proposal later this month to raise the necessary money through taxes or fees to fix the financially beleaguered transport network. Today, the details of where the money would be coming from and how much were revealed by the Governor and MassDOT. The original Globe article on the issue highlighted that the annual gap between actual needs and what is actually raised and spent amounts to nearly $1 billion annually. This comes even after many years of reform that have consolidated a number of state agencies under MassDOT and produced efficiencies that have saved the state countless hundreds of millions of dollars over the years. Likewise, there are many transit, commuter, and even high speed rail agencies that operate in similar climates in Europe that have overcome[PDF] sub-zero temperatures. By investing in weather-resistant infrastructure that is engineered to anticipate winter conditions and maintaining a modern fleet of trains, service impacts remain low. Sometimes, even the older equipment gets pulled out to help battle snow, much less extreme cold conditions, as happened in Sweden in 2010. That said, it's no wonder the MBTA encounters such severe weather-related issues, even without snow. 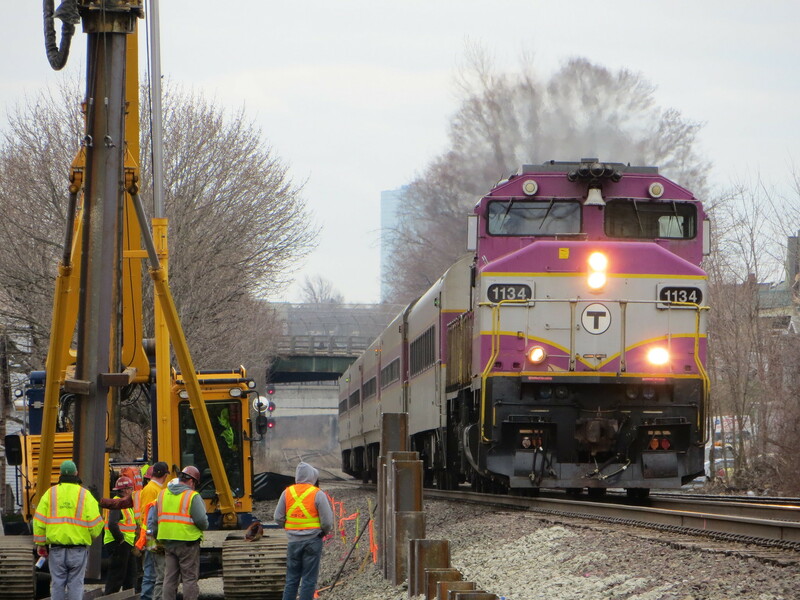 No amount of consolidation or reorganisation of the MBTA or MassDOT can generate the amount of money to buy new signals, trains, or track needed to even prevent equipment-related delays on a sunny spring day. It's time to make the hard decisions and start raising new revenue or increasing the amount that comes from existing revenue sources. If you actually make people pay out of pocket to get a faster trip, people aren’t willing to spend that much. We have two bridges across Lake Washington. One has to be replaced. They put a toll on it to help pay for the project, and immediately traffic plummeted. People are driving around to get to other side, driving on the other road, sitting through congestion, timing their trips differently in order to avoid tolls. People really, if they have to pay out of pocket for a quicker trip, they don’t place much value on it. So we’re expecting taxpayers to foot the bill for things the drivers themselves will not pay for. With that in mind, why shouldn't transit riders also be made to pay more out of pocket for transit improvements? The truth is that we, as a state and a nation, have been subsidising roads more than transit by a large margin for decades and those public investments have done little to provide effective core services. In fact, T riders pay more in fares ($451 million in 2011) to run the T than drivers pay in tolls across the Tobin Bridge and entire Turnpike ($350 million in 2011) to pay for a much larger and more expensive system. Taking the long view, it cannot be said enough that MassDOT and the MBTA can better capitalise on their existing properties by developing on them instead of selling them outright. Selling property and air rights is one way to gain revenue but is not a viable long-term solution. Property is the most valuable asset of any railroad and Japan's railroads have known this for years. Build homes and businesses in a walkable pattern around your stations and your network and its destinations become that much more accessible. In the long run, you have a steady stream of income from property rentals and fares from riders who depend on your system. Somerville's Assembly Square mega-project is the best example of this type of destination-creating redevelopment that is fuelled by transit. My only issue with the project is the alarming 7,500 parking spaces that will be constructed for such a walkable development adjacent a new $57 million Orange Line station. Furthermore, building more transit-oriented development and strengthening those neighbourhoods has the potential to address the growing demand for market-priced units and outstanding need for affordable housing. The impact of new user fees on the impoverished who need to drive to work is an unfortunate reality. This can only be mitigated by providing quality, transit-accessible neighbourhoods with good access to affordable housing, jobs matched to the skills of those residents, and quality schools that provide them and their children access to upward social mobility. As more opportunities arise for people to live in areas better able to serve transit, the case for outward growth and maintenance of far-reaching transit routes declines as the case for road-based user fees increases politically. Value capture taxes are also another way to revenue from development around stations. In addition to adding value to our existing transit system, new developments bring higher property values. Value capture capitalises on this rise in property values by enforcing fees or taxes on developers or landowners in the area of redevelopment and can go right back into maintaining the very infrastructure that serves that neighbourhood. Ultimately, it's long-term, smart growth strategies championed by MAPC and MassDOT's mode shift initiative that will limit the amount of new infrastructure that we'll have to borrow to spend and maintain. They will also allow us to derive more value from the infrastructure we've already built and are currently paying for. New road construction cannot continue to be used as an argument for continued debt spending under the prospect of economic development when our crumbling core infrastructure is inhibiting in-place economic growth. In the short term, there are several ways the state can improve the sorry state of affairs with transportation funding, but most involve making tough decisions about new taxes or fees. Even less can be done in the near term to reduce the need for additional spending to maintain our crumbling infrastructure. I've been fairly preoccupied with life lately, so this story (and many others) nearly flew right under my radar, but not before I had a chance to catch the original posting on the Boston subreddit. In short, the MBTA is one step closer to making corporate-sponsored station names a reality in a last ditch and fairly ineffective attempt to grasp at straws for new revenue. No doubt the MBTA is having to continue pursuing this as a means of proving to state leaders that they are doing what they can to resolve the internal financial problems at the T to the best of their ability. Either way, it turns out that the study by IMG Worldwide found a market for station naming rights and would bring in a potential $18.4 million a year to sell rights to 11 key stations throughout the system, leading to a total $147 million over eight years, according to the MBTA report to MassDOT. According to Mark Boyle, Assistant General Manager for Development and the representative of the MBTA who briefed MassDOT on the proposal, this could be good to go by mid-summer as sponsors line up to have their brands share sign space with historic Boston subway station names. The unfortunate reality is that this tactic has historically failed to bring in the revenues promised here in Boston and elsewhere. It is a considerably less solid deal with corporations than encouraging developers to build on MBTA property and invite corporations to lease space within those well-situated, innercity developments to bring long-term revenue in as they have been doing for decades in Japan. This is yet another short-term, short-sighted fix. In the 8 years these contracts would run, a well-designed contract that gives the MBTA a way out of deals that go sour and holds developers accountable for delays could build thousands of housing units (hopefully less stratified than what we already have and actually addresses the glaring housing issues plaguing Boston) and square feet of commercial office and retail space over, in, and around stations. This would further ensure sustained ridership levels, possibly increase non-rush hour ridership, and provide the sustained funds from real estate leasing to maintain and even improve our ailing system. At the same time ridership growth threatens to overload the system in coming decades, it would be beneficial for the MBTA, Boston, and Commonwealth to create mixed-use neighbourhoods around transit (not at the far flung suburban stations) where people can walk to work and alleviate increasing uni-directional rush-hour traffic volume while still providing new revenue for the T through value capture policies. There are precedents for doing that here in the US already and many municipalities are adopting these long-term plans to provide additional funds for further improvements from the initial investments (e.g. new light rail lines, subway extensions). Most importantly, transit-accessible office space is far more valuable to any of these potential investors than the relative pennies they're throwing at the MBTA to slap their name on a station. We have the potential to create new neighbourhoods, strengthen existing ones, provide housing for thousands, and bring back tax revenue from companies that have long since fled Boston proper because of its lack of accessible, modern, and affordable office space. Boston is low on the list of world-class cities playing host to Fortune 500 companies, Liberty Mutual being the only company to call Boston home. Two others, Raytheon and TJX, apparel and home fashion megachain, sit just outside of Boston in outlying suburban office parks accessible by I-95/Route 128, but hardly walkable from any commuter rail station. While we deliberate and the MBTA/MassDOT continues to insist on calling suburban islands of development around massive commuter parking garages at its fringe stations is 'transit-oriented development', the Boston Metro region will continue to flounder as residents struggle to commute to work in suburban office parks only accessible by car as traffic increases and gas prices soar. Now more than ever does transit matter.